You should read this book if you want to get a glimpse into the world of camorra, the other Italian mafia from the south of Italy. In itself the book is also about the problems of South Italy the underdeveloped "third world" and the poor part of the country whereas the North is industrially developed. But the south is not just that, it has cheap labour force which is used by the blackmarket and also by the Italian fashion companies who produce here their famous "Made in Italy" products and also it is used as a garbage dump, a deposit of industrial waste polluting the land and making the people sick. Probably you ask: what does it have to do with the mafia or with the camorra. Camorra takes part in producing the high quality counterfeit fashion clothes and it's firms deposit illegally the waste in the former farm lands of south poisoning the earth. In the end camorra reinvests the money in the northern firms making their own people poorer and the north richer. The book takes us in a land similar to wild west, where the weapons are at home, Camorra is also a weapon dealer. We read about Neaples where camorra is at home about how the mafia is holding grip of the economy in a "liberal" way, we read about it's drug affairs, we read about Secondiliano outskirt of Neaples which is the poorest and where the fashion clothes of Hollywood are made, we read that this is the region in Europe where the most killings happen, this the region where most of Mercedeses are sold to. 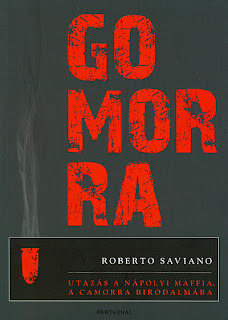 It's not a novel or fiction but an interesting page-turner documentary on the lives of the people of Campania region (which includes also Naples) , the lives which are run by Camorra (the System as he calls himself) by his own laws. Build your personal library with Scribd, your online library, bookmark your favorite titles and save them to read now or later. Always have your e-books when you need them with Dropbox! Reading, searching for books online or in bookshops is a pleasure for me. As you may guess you will find here books I am reading or ones I've read and my personal thoughts. Dear visitor find some reading ideas here!